Between mid-May and mid-June, foodies eagerly await the arrival of the highly-prized (and typically expensive) deliveries of the various “Wild Copper Salmon” from Alaska. Restaurants compete over who can get their hands on the first batch of the highly-coveted fish. Up north in Alaska, it’s a mad dash to catch these salmon, with hundreds of fisherman primed to capture as many lip-smacking specimens of “the best fish in the world” as they can. Here are some basic facts about the Copper River fishing craze. Located in central Alaska, the 300-mile Copper River is one of the biggest rivers in the nation. It originates from the Copper Glacier, which lies on the northeast side of Mount Wrangell. Countless unique ecosystems stem from more than a dozen tributaries that flow into the river. The river earns its named from the abundant copper deposits along the river, which were used by the native population and later settlers from the Russian Empire and eventually the United States. Commercial fishing made its way to the mouth of the river in the 1880s, when the first cannery was erected with the backing of the Pacific Packing Co. Today, two million salmon make their way to the Copper River watershed for spawning every year. The Copper River is home to three popular species of salmon: King, Sockeye, and Coho. The King salmon, also known as Chinook, is the largest salmon in the world and has an average weight of 45 pounds. It is known for its rich red flavor and firm texture. The Sockeye salmon, the most abundant species of the group, typically weighs an average of 6 pounds and has a reputation for its preferred, highly “salmon-esque” flavor. The Coho species typically weighs 12 pounds and is popularly served in steak or fillet forms. After being reeled in, all varieties of Copper River salmon are “bled” and dressed with ice by the fishermen before shipping. 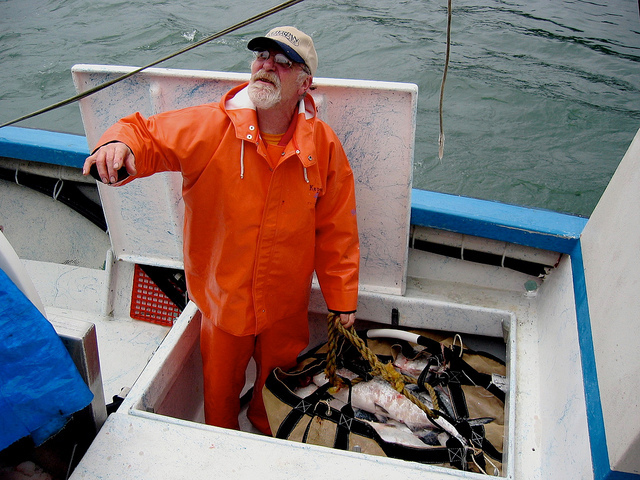 In 2011 alone, fishermen caught 1.2 million Sockeye, 9,000 King, and 293,000 Coho. Diners across the world can’t get enough of the fish’s abundant omega-3 fatty acid and top-tier flavor. Annual household permits are required for fishing and dipnetting in the Copper River. The Alaska Fish and Wildlife Department requires fishermen to record the variety of salmon caught before they are transported from the river. By the time of opening day, over 450 licensed fishing boats are out on the river ready to reel in as many as 700 salmon per fisherman in one trip. If you want to fish the Copper River, you can get in on the action by getting some fly fishing gear and heading over to the Copper River Princess Wilderness Lodge for a “taste” of the salmon-catching experience. For a more in-depth look at Copper River Salmon fishing, check out this video from Copper River Seafood and Princess Alaska Lodges. See current specials at Copper River Princess Lodge.